There are a ton of ways to stay creative and keep things fresh and new in the summer. We all know that summer time is time for outdoor play and possible vacations, but let's be honest... we can also need some assistance as parents when it comes to having activities ready. I am a believer in down time and boredom, but sometimes we need something quick for kids to enjoy. This is where "box" of fun comes in. The Kiwi Crate is a great way to have something fun and ready to go upon arrival. Right now you can try it for free, just pay $3.95 for shipping! Build and experiment with your very own pair of rockets that fly! Learn how rockets can travel through the air differently. Then measure the distance with your flight chart to see how far they can travel. Learn about the many ways airplanes and rockets fly in our explore! magazine with bonus projects and activities! All the materials to build your pair of rockets Bonus flight chart to help measure distance traveled Set of metallic markers and pom poms to personalize your rockets 16 page explore! magazine filled with kid-friendly recipes, puzzles and a bonus gliding airplane Get a Free Trial - Your free trial project will ship within two business days. You will have 14 days after your trial project ships to cancel your subscription. 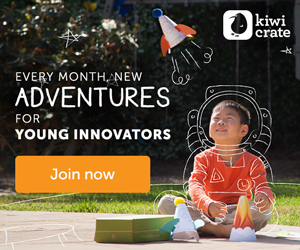 If you choose to not cancel, you will be charged $19.95/month and receive 2-3 new projects per month with your Kiwi Crate monthly subscription. You may cancel at any time. Offer only available to U.S. residents. NOTE: This is a sample crate. Each July and August crate will include exciting summer themed projects, bonus activities and fun surprises for the family! Try it today - currently, new subscribers can save 25% on a 1st month subscription with code SUMMER25. This deal may close at any time.